Medway Queen was ordered in 1923 and entered service on the Strood-Chatham-Southend-Herne Bay route the following year. With occasional excursions elsewhere she served on the same route until the beginning of the Second World War. The ship was requisitioned in 1939 and converted for mine-sweeping. In 1940 HMS Medway Queen joined the 10th Mines-weeping Flotilla based in Dover. In 1946/7 she was refitted and returned to civilian use. By the early 1960s paddle steamers were struggling to compete with newer-type vessels and the Medway Queen made her last voyage to Southend on 9th September 1963. After several attempts at preservation had failed, the ship was towed in August 1965 to the Isle of Wight and became a restaurant & nightclub. The Medway Queen Club was popular for wedding receptions and the on-board restaurant was a favourite with locals and holidaymakers alike. In the evenings the it became a night club with disco and live music. Following many years of frustration and hard work the society secured the backing of the Heritage Lottery Fund and, later, the European Regional Development Fund to rebuild the ships hull and establish a base and workshop at Gillingham Pier. The hull rebuild was undertaken in Bristol and completed in late 2013. 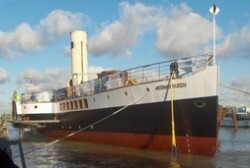 Medway Queen was towed back home and is now moored at Gillingham Pier where she can be visited. Receive our newsletter, the 'Full Ahead', which gives you up to date information on what is happening with us right now, as well as exclusive articles written solely for the newsletter. Be sent a membership card with your unique membership number.